Ideally, a root canal leaves the remaining tooth structure sealed off from the rest of the mouth and from bacteria. Generally root canal therapy in Huntsville lasts for many years and is effective. If, however, some bacteria were missed during the original root canal procedure, they can grow and cause the need for additional treatment. If you’ve experienced a failed root canal, make an appointment with an endodontist, someone who specializes in saving natural teeth. They can evaluate your situation and let you know what your treatment options are. What is the next step when a root canal fails? Your endodontist may find that another root canal is possible. However, if retreatment isn’t a viable option, the next step is likely tooth extraction and placing a dental implant. Although extraction is usually used as a last resort, there are situations where removing the infected tooth is better than leaving it, such as if it could cause serious oral infections or spread decay to other teeth. 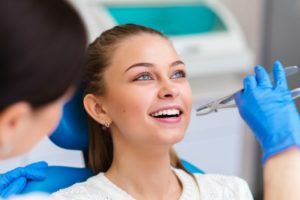 Also, extracting the tooth can alleviate any pain you’re experiencing, and healing from an extraction isn’t as bad you may think, especially if you have a dental implant placed immediately following the extraction. Why should I consider getting a dental implant after a tooth extraction? Out of all the restoration options available, dental implants provide the best that dentistry has to offer. It addresses the entire tooth structure including the root, unlike dentures and bridges, which only replace the crown or top of the tooth. Because of this, dental implants keep the jaw bone stimulated, preventing the bone density loss that is commonly experienced with dentures or bridges. Over time, keeping the jaw bone strong helps preserve your other natural teeth for much longer as well. If extraction is the best treatment moving forward, consider getting dental implants so that you can return to full oral health. In the end, your endodontist can provide the treatment you need to regain your healthy, happy smile, whether that’s through root canal retreatment or through tooth extraction and dental implants. By finding the right endodontist, you can address your infected tooth and get back to oral health sooner rather than later. Contact your endodontist today to get the relief you need from your failed root canal! After getting her DMD from the University of Alabama School of Dentistry, Dr. Deborah Bishop completed an endodontic residency at the University of Alabama at Birmingham. She has also served on a number of councils for the American Association of Endodontists. In her practice, she has provided high-quality endodontic care to patients in the Huntsville area for many years. To schedule an appointment with her, you can call (256) 882-5161 or click here.